Some of the most important and often overlooked skills in innovation are time and patience. Did you know it took Amazon three iterations over four years to arrive at Amazon Marketplace? What would have happened if Amazon had an innovation time limit? 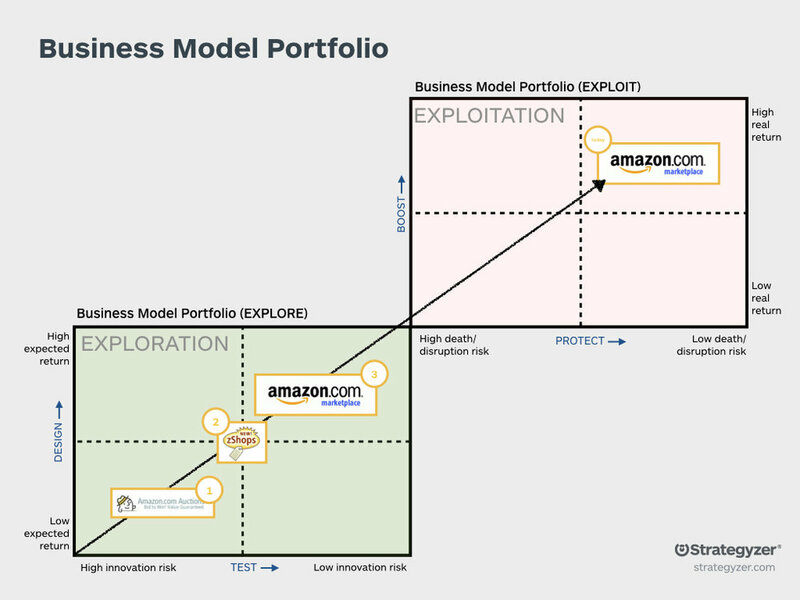 What if I told you that if you could wait four years and work through three business model iterations, you’d finally land on an idea that would grow to have revenues more than five times its closest competitor? Most companies today, however, don’t have the time and shareholder support to work through an innovation journey. This is why innovation metrics are so important and often so different from traditional business metrics. Amazon launched Amazon Auctions in 1999 in an effort to compete directly with eBay. (Both Amazon and eBay launched their original businesses in 1995). While Amazon Auctions was faster and had better search than eBay, Amazon Auctions never quite took off. Some consumers found the site confusing — is Amazon selling retail or auctions? Amazon Auctions also could not compete with eBay’s first mover advantage when it came to network effects — eBay had the buyers and the sellers — why move to Amazon? Later that same year, Amazon launched zShops which provided storefronts to third party retailers. zShops launched with 500,000 items as a new tab on Amazon’s site, hoping to steer curious buyers from its 12million customers. Amazon offered transaction processing, and charged sellers commission and a monthly participation fee. Amazon hoped to leverage its own traffic and expand its selection, but both buyers and sellers weren’t convinced by the user experience of additional stores and tabs. In 2003, Amazon launched Marketplace which is its third party e-commerce platform. The Marketplace leverages Amazon’s fulfillment and logistics network as well as its platform to reach Amazon’s massive customer base, and Amazon continues to take a fee for each product sold. The difference to customers, however, is quite subtle. Amazon updated its website so that when a customer is searching for a product both the Amazon and Marketplace products are listed — the user doesn’t have to visit a specific store front or navigate tabs — Amazon gets a fee regardless of who the seller is. (To tell the difference while shopping, look for who “fulfills” the product). Marketplace is also unique in that Amazon chose to create a platform where it effectively compete against itself, as third party vendors may have the upperhand in terms of price. Today, Amazon Marketplace has over 6 million sellers and in 2018 had $175BN in retail sales (68% of Amazon’s total sales 5 times that of eBay, its closest US competitor). While Amazon is known as an innovative company, and Jeff Bezos as one who embraces failure and change, in order to arrive at Marketplace, Amazon had to be willing to constantly adjust its business model to find the right match for its strengths and its customer base. Innovation requires experimentation and constant iteration, and often a tremendous amount of time. If new businesses are judged quarter to quarter, some will definitely fail, and be thrown out. Patience and persistence are required in innovation. We can’t afford to throw out innovations like Marketplace. Make sure your metrics, your timeline and your persistence match your business strategy.